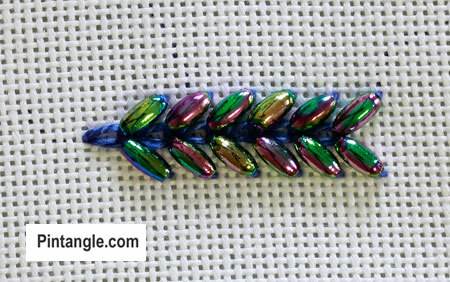 Wheatear stitch is a versatile, simple stitch to work that is very easy to add a bead too as you embroider. 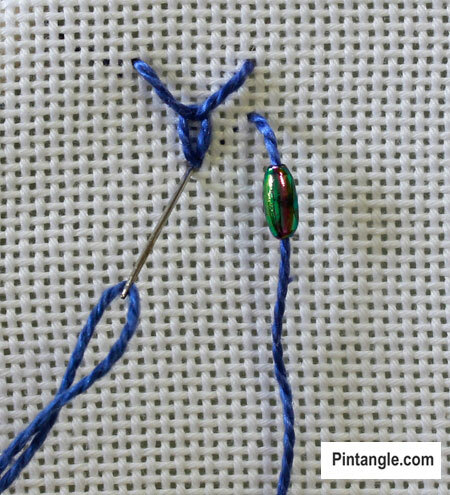 The trick with any of the hand embroidery stitches you add beading to, is to use a size 26 tapestry needle. 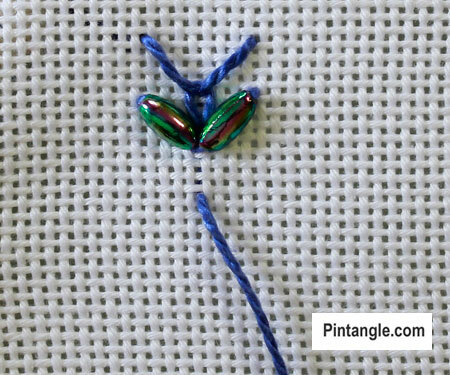 Since the eye of a tapestry needle is long you can thread perle #8 or perle #5 thread through the long eye. However the needle itself is thin which means you can add a bead to your working thread as you stitch. 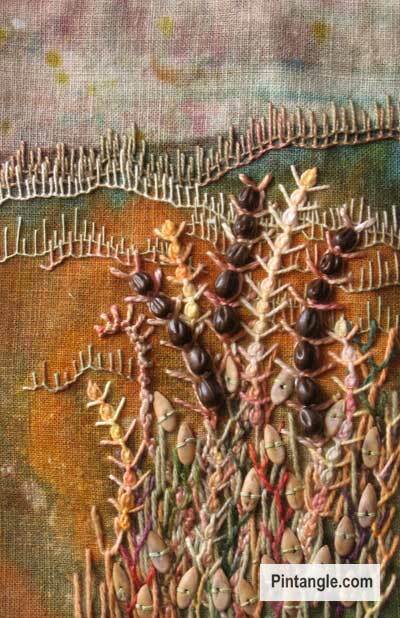 In the sample above varieties of Wheatear stitch is used to depict wild grasses. Various forms of wheatear are used but most noticeable is a beaded version. The hand embroidery is set agains a hand painted linen background. I used hand dyed cottons and also substituted many of the chain stitches with oyster stitch. The stitch is worked in a downward motion. Commence with a single wheatear stitch . Bring your needle out at the point where you would start to work the next set of diagonal stitches straight stitch also worked at an angle as illustrated. Thread a bead on to your working thread before you take your needle to the back of the fabric as illustrated. 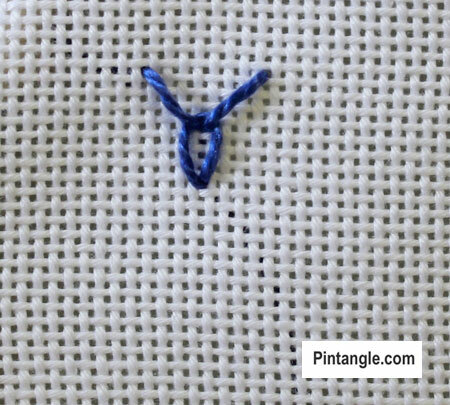 Bring your needle out on the left side to make another diagonal stitch. Add a second bead and take your needle to the back of the fabric. Make sure the base of the stitch meets the base of first stitch. Bring your thread out a little below the base of the V.
Pass your needle under the two diagonal stitches to make the chain like loop. 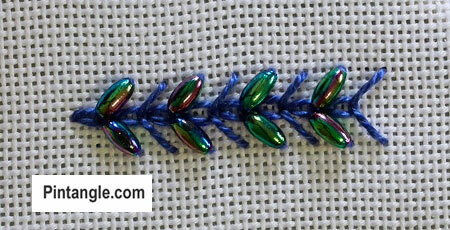 Make a regular wheatear stitch then a beaded wheatear stitch and continue in this manner down the line. You can bead every ear of the stitch or as I have done in the directions which is to bead every second set of ears. 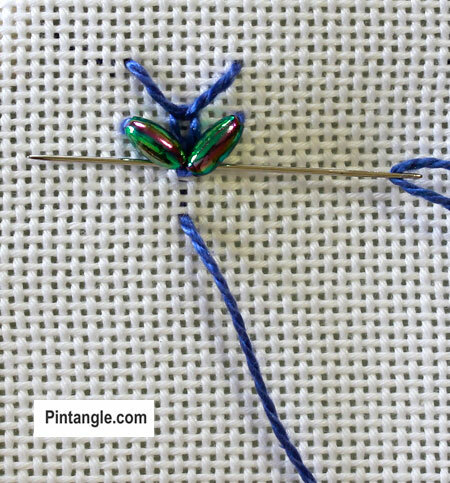 This is a versatile beaded version of wheatear stitch that will follow a curve well and can really add some zest to a piece. Enjoy! GRACIAS POR COMPARTIR, ESTE HERMOSO TRABAJO. Many thanks, Sharon, for the wheatear stitch – just what I needed. I am making a small fabric book of my favourite quotes, one of which is “Don’t judge each day by the harvest you reap, but by the seeds that you plant. I am doing a small picture of wheat stalks, poppies and poppy seed heads, so the timing of your stitch tutorial was perfect. Wheatear beaded is really lovely and the oil-slick beads add to the look. I think this would look good on Christmas CQ work too. I will try some on mine and post a photo soon. that’s a beautiful natural effect. Love your work, very helpful!